Sow stalls have already been banned in the United Kingdom and Sweden and will be soon phased out in Finland, Switzerland, the Netherlands and Denmark. 29% of New Zealand pig farmers still use sow crates which measure only 200cm x 60cm; this is only slightly larger than a full-grown sow and does not even allow room to turn around. 45% of sows in New Zealand – 21 000 animals – are kept in these torturous conditions. Under the new regulations, use of the stalls will be limited to four months after mating in 2012 and eliminated entirely in 2015. By international standards this is fast, more common phase-out periods overseas are about 10 years. 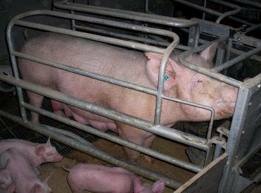 From December 2012, sow stalls can be used for four weeks per gestation, presently there is no time limit.Farrowing crates – used to keep the mother from crushing her piglets in confined conditions – are to be used for five weeks per gestation, instead of six weeks. We will have [farrowing crates] for as long as we have intensive systems which require the sow to have more piglets than she can actually manage. Dr John Hellstrom, chairman of NAWAC, said that farrowing crates would probably be banned when a cost-effective alternative was developed in the next five to 10 years. This is a victory for animal welfare campaigners and is the fruit of a ten-year struggle by Green MP, Sue Kedgley, who has said that the next step is to ban the sale of pork raised overseas in sow crates. The media campaign was an object lesson in the type of political capital and leverage that can be achieved by a focused, well-run media effort such as the Love Pigs campaign coordinated by SAFE. What are some lessons we can learn from this that can applied to future campaigns? Pigs were chewing at the bars. Froth was coming out of their mouths and they were screaming. It was like they were screaming for you to help them. They were just looking at you terrified, but hopeful. It was just harrowing and disgusting. The longer the story is kept in the news, the more influential it will be in altering public opinion. Normally, a producer can wait out the storm, secure in the knowledge that the story will only be aired for a few days at the most. What was remarkable about this particular controversy was its longevity in mainstream media outlets. Typically, an animal welfare news item is used up within a one-week news cycle. Releasing the story in a staged manner is a very effective way of prolonging this exposure. SAFE pre-empted the standard official reaction; that what was seen in the footage was an extreme example of animal cruelty and not normal for the industry. Usually an investigation will be promised, the inference being that we have witnessed something irregular and possibly illegal. This was a deft move for two reasons. First, the Levin piggery at the centre of the story is owned by one of the biggest farmers in the business and a former director of the Pork Industry Board, Colin Kay, responsible for the care of a substantial proportion of New Zealand’s intensively farmed pigs. Secondly, the activists knew that it would almost certainly be found that the conditions – shocking as they were – were within legal standards. Indeed, the farm had been twice before investigated by MAF (Ministry of Agriculture and Forestry) inspectors who found no breach of the relevant welfare code in either case. This finding shifts the debate from one of finding and punishing aberrant wrongdoers to one of questioning the conditions that have been kept from the public gaze and the legal system that permits them. The Pork Industry Board – a statutorily created, farmer-funded body – has gone to great lengths to keep the true state of farming conditions from seeing the light of day. I’ve posted here before about the Board’s connivances to keep information secret and to avoid its obligations under the Official Information Act 1982. And as you look for a job? Or maybe you earn so much that new job you do not care? Do you know any other portals with job offers that are worth visiting? The screaming sows seen in the vid with Mike King looked to me to be yelling for a feed, whihc htey likely expected to get when disturbed in the night. Since people farmed pigs they’ve rused different gadgets to save pilets from careless sows. Sows do tend to flop rather than lie down. Some are much worse than otehrs. In my day, teh fashionable thing was a creep with a heat lamp (or in the case of a piggery near Rotorua that I worked in, underfloor steam heating) to encourage the piggies to sleep away from the sow, or a round farrowing house which made the sow lie with her back to the outside wall, coupled with a creep for the piglets in the middle of the house. I find Robin Kippenbergers statement curious…does she think it OK that piglets die because the sow “cannot manage.” The SPCA is unlikely to accept “can’t manage” as an excuse when incompetent farmers lose numbers of stock.